University of Medicine and Pharmacy “Carol Davila” Emergency Institute for Cardiovascular Diseases “Prof. Dr. C. C. Iliescu”. Brugada syndrome, first described in 19921, is even nowadays, a disease in which the decision of a prophylactic therapy of sudden cardiac death (SCD) is difficult to make in borderline situations. We present the case of a male patient, F.C., 36 years old, with positive cardiovascular risk factors (hypercholesterolemia, smoking), discovered by chance, at a routine examination at work, with an electrocardiographic pattern which was highly suggestive of Brugada syndrome and who was admitted in our Clinic in November 2014 for further investigations. 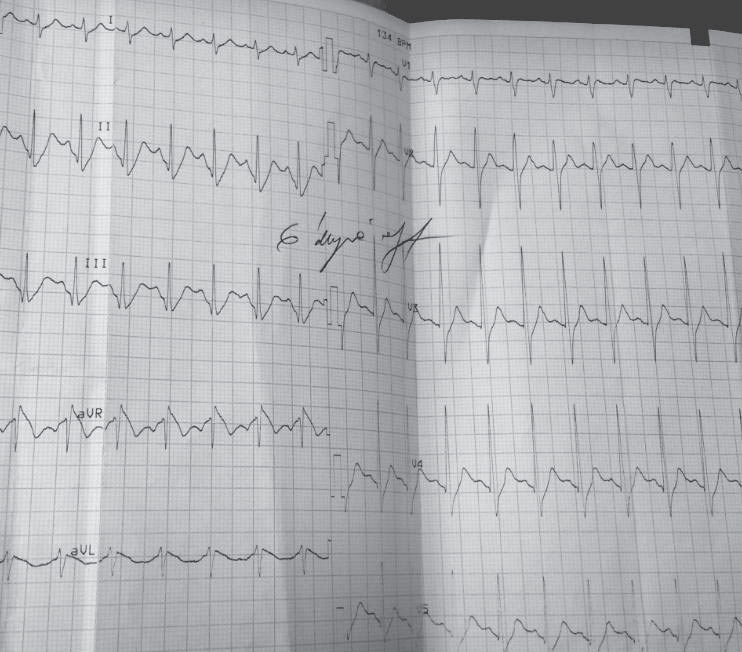 The patient recounts rare and brief episodes of palpitations. The patient has no personal history of SCD, syncope, documented ventricular rhythm disorders or known family history of SCD. The physical examination on admission reveals a normal weight patient, with sinus tachycardia (100 beats per minute), a blood pressure of 120/60 mmHg, with no cardiac or vascular murmurs that could be heard and no signs of systemic or pulmonary stasis. Biologically, the patient presented hypercholesterolemia; the thyroidian hormones were normal. The resting electrocardiogram (ECG), on admission, reveals sinus tachycardia, 101bpm, an incomplete right bundle branch block with an important ST-segment elevation (descending type) from V1 to V2 and negative T wave in V1 and V2 (Figure 1). Figure 1. Resting electrocardiogram on admission. Sinus tachycardia, 101bpm, an incomplete right bundle branch block with an important ST segment elevation (descending type) from V1 to V2 and negative T wave in V1 and V2. Figure 2. Resting electrocardiogram 3rd day of hospitalization. Sinus tachycardia, 100bpm, a normal aspect of QRS complex and T waves. Figure 3A. Transthoracic echocardiography, parasternal section on the long axis. 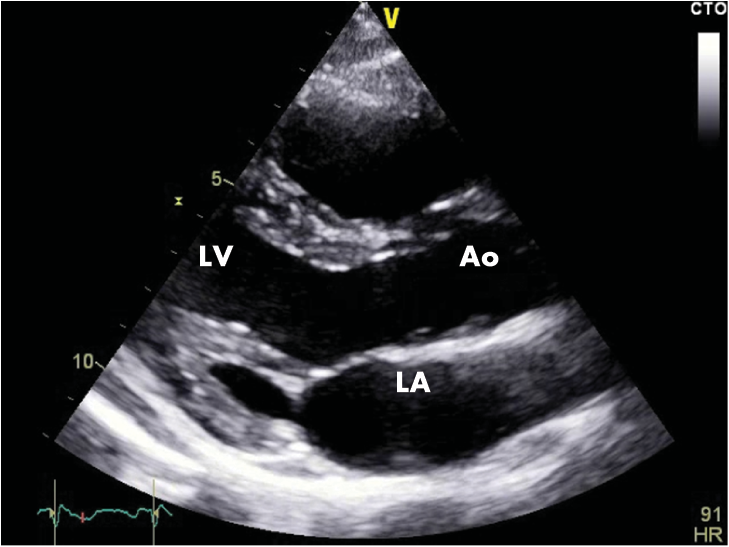 Normal echocardiographic aspect (LA=left atrium, LV=left ventricle, RA=right atrium, AO=ascending aorta). Figure 3B. Transthoracic echocardiography, apical 4 chambers section. 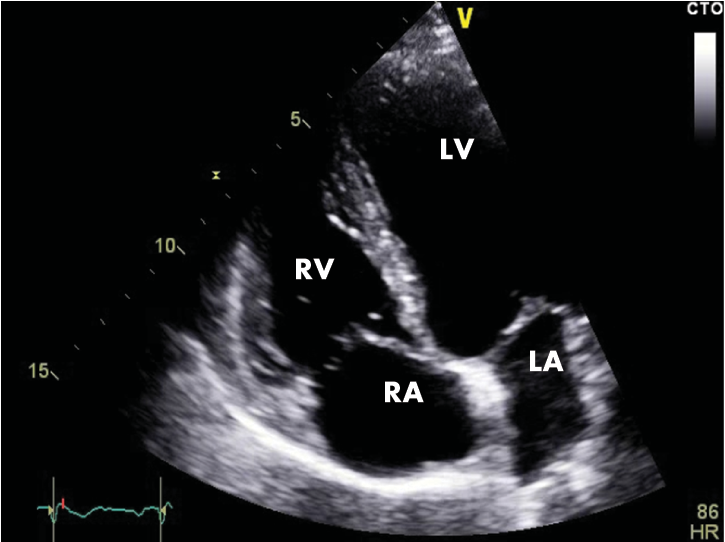 Normal echocardiographic aspect (LA=left atrium, LV=left ventricle, RA=right atrium, RV=right ventricle). We repeated the resting electrocardiograms throughout the period the patient was admitted in our clinic and on the third day of admission we found a completely different, yet spontaneously, electrocardiographic findings: sinus tachycardia, 100 bpm, and a perfectly normal looking QRS complex, with no T-wave changes (Figure 2) and then, a few days later, and spontaneously also, the patient had the same electrocardiographic pattern as on admission day. The chest radiography is normal and so is the transthoracic echocardiography (Figure 3A and 3B). The patient performed a cardiac stress test (by exercise on a treadmill) which proved to be negative for arrhythmias or conduction disturbances or ischemia and showed a normal capacity to tolerate effort. We emphasise the fact that the patient starts with a normal ECG (with no Brugada pattern) and throughout the test (for 9 minutes and 30 seconds) (Figure 4) and after it (Figure 5) the ECG remains normal. The 24-hour Holter monitoring does not reveal any ventricular or supraventricular arrhythmias or conduction disturbances. At this point, having all these clinical and electrographic findings from our patient, we put the diagnosis of spontaneous Type I Brugada syndrome, with an intermediate-to-higher risk to develop potentially lethally ventricular arrhythmias and we considered that he may benefit from an internal cardiac defibrillator for primary prophylaxis of SCD. Figure 4. Electrocardiographic aspect during the cardiac stress test (minute 9) with no Brugada pattern observed. Figure 5. Electrocardiographic aspect during the cardiac stress test (6 minutes post-effort) with no Brugada pattern observed. We informed the patient of potential risks of malignant ventricular a arrhythmias, including SCD, and of all possible complications of a cardiac defibrillator implantation, so the patient chose well informed and willingly the implantation, which was performed during the same hospitalization (Figure 6). The psychological motivation of the patient, a very well informed patient on the whole Brugada issue, as a matter of fact, was that “he could not afford an unexpected event, because he had a family to support”. Figure 6. Chest radiography, postero-anterior view. Normal radiological heart and lungs. Left subclavicular cardiac defibrillator, with one lead on the right ventricle. At that time, in November 2014, patients with Brugada syndrome who were asymptomatic and had no evidence of induced ventricular tachycardia/ventricular fibrillation had a Class III level of evidence C indication of internal cardiac defibrillator implantation, as it was recommended by the 2001 Task Force on Sudden Cardiac Death of the European Society of Cardiology2. We had also made recommendation of lifestyle changes to our patient, such as avoiding large meals and excessive alcohol intake and prompt treatment of any fever; we also recommended family screening. At the 6th month control of the internal cardiac defibrillator, we interrogated the internal memory of the device and found no evidence of malignant ventricular arrhythmias. In 1992, Brugada brothers published a study in which they described a novel autosomal dominant inherited disease, characterized by ST segment elevation in the right precordial leads, right bundle branch block and susceptibility to ventricular arrhythmias, all in the context of a structurally normal heart. The disease was named Brugada syndrome and its prevalence is higher in the Far East and there is a ratio of 8 male to 1 female in clinical manifestation3,4. The later on studies demonstrated a mutation on SCN5A gene, a mutation involved in the pathology of the cardiac sodium channel, confirming the hypothesis that Brugada syndrome is an electrical disease, clearly separated from those structural heart disease that have a potential risk for ventricular arrhythmias5. We know today that there are at least 12 genes involved in the pathology of the Brugada syndrome, and the best documented are SCN5A and CACN1Ac. The clinical manifestations of the Brugada syndrome are syncope and/or cardiac arrest, typically occurring at rest6 or during sleep, especially in the third or the fourth decade of life. 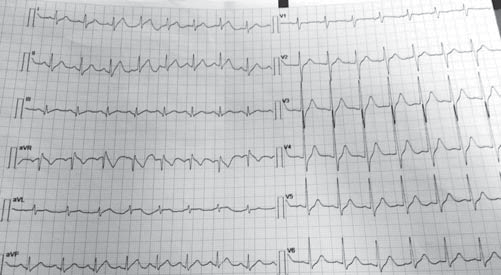 The diagnosis of Brugada syndrome may be challenging because of the intermittent electrocardiographic pattern; one may need to perform provocative drug testing with Class IC anti-arrhythmic drugs such as ajmaline, flecainide or procainamide7. Our patient, in particular, presents a spontaneous intermittent electrocardiographic Brugada pattern, with a pathognomonic type I Brugada ECG on admission, and the next day, without any changes in his clinical or biological status, he presents a perfectly normal ECG. 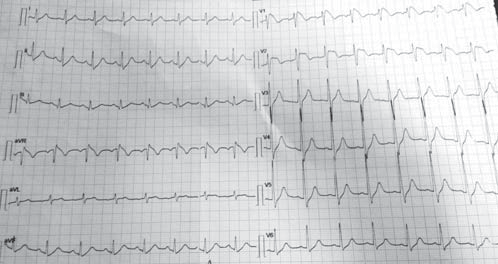 There are numerous cases of intermittent electrocardiographic pattern Brugada syndrome described in the medical literature8, but most of them came into medical attention because of their clinical manifestations: syncope, ventricular tachyarrhythmias, cardiac arrest or even mimicking an acute myocardial infarction9. We also want to emphasise on the importance of a well done ECG; a wrong position of the right precordial leads (V1-V2), with one or two intercostal spaces upwards, may create a false impression of a possible hidden Brugada syndrome. In the clinical and the electrocardiographic context of our patient we considered it unnecessary to perform a challenging test with Class IC drugs, because the electrocardiographic changes at rest in our patient are pathognomonic for the type I Brugada syndrome. From a prognostic point of view, the Brugada syndrome is responsible of 4-12% of all sudden cardiac deaths and at least 20% of suddent death with structurally normal heart10,11. No anti-arrhythmic drug was proven so far to be efficient in preventing malignant ventricular arrhythmias in Brugada syndrome; the best treatment in these cases remains the prophylaxis (primary or secondary) of SCD by implantation of cardiac defibrillator. In order to identify the patients at risk of developing such lifethreatening arrhythmias, some specialists proposed a risk stratification scheme, using the history of syncope and the presence of a spontaneously electrocardiographic pattern as the clinic variables for quantification of risk12. We applied this scheme to our patient and it shows us that the patient belongs to the 41% of Brugada patients with intermediate risk, only by having a spontaneous Brugada pattern. In this intricate context and because recent studies demonstrated that patients with spontaneous Brugada pattern have yet a high risk of developing malignant ventricular arrhythmias13,14 and there is no difference between the risk of the patients with intermittent electrocardiographic pattern and those with persistent electrocardiographic pattern7, we decided to implant a cardiac defibrillator to our patient. 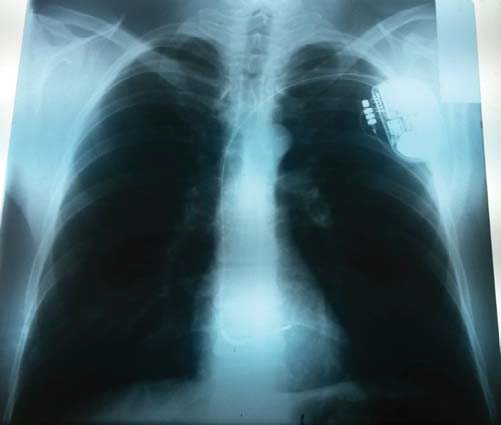 There is an another discussion in this case, whether we should have performed a programmed ventricular stimulation (PVS) before the implant, in order to see if our patient is at risk of cardiac arrest. There is a disagreement between various electrophysiologists’ opinions at this moment; while Brugada and co-workers showed that PVS has a high sensitivity in predicting the risk of SCD15, Priori16, Gasparini17, Eckardt18 and others failed to demonstrate this. Performing a PVS is a Class IIb level of evidence C recommendation on the 2001 Task Force on Sudden Cardiac Death of the European Society of Cardiology2. This is why we didn’t consider it necessary to perform a PVS before the implantation of cardiac defibrillator in our patient. In the ESC “Guidelines for the management of patients with ventricular arrhythmias and the prevention of sudden cardiac death”, published in 2015 in European Heart Journal19, the experts say that the implantation of cardiac defibrillator is the only effective treatment for reducing the risk of sudden cardiac death; quinidine was proposed as a treatment to prevent malignant ventricular arrhythmias, because it was observed that it reduces VF inducibility during PVS (Class IIb level of evidence C recommendation) if PVS was made under anti-arrythmic treatment, but there is no evidence to support quinidine’s role in preventing SCD, so far. Conflict of interests: none declared. 1. Brugada P, Brugada J. Right bundle branch block, persistent ST segment elevation and sudden cardiac death: a distinct clinical and electrocardiographic syndrome. A multicenter report. J Am CollCardiol. 1992 Nov 15;20(6):1391-6. 2. Priori SG, Aliot E, Blomström-Lundqvist C et al. Task Force on Sudden Cardiac Death of the European Society of Cardiology. Eur Heart J 22:1374, 2001. Medicine.7th Edition. Eds. Douglas Zipes, Peter Libby, Robert Bonow, Eugene Braunwald. Elsevier Saunders, 2005, 692-693. 4. Antzelevitch C. Androgens and male predominance of the Brugada syndrome phenotype. Pacing ClinElectrophysiol. 2003 Jul;26(7 Pt 1):1429-31. 5. Chen Q, Kirsch GE, Zhang D, Brugada R, Brugada J, Brugada P, Potenza D, Moya A, Borggrefe M, Breithardt G, Ortiz-López R, Wang Z, Antzelevitch C, O’Brien RE, Schulze-Bahr E, Keating M, Towbin JA, Wang Q. Genetic basis and molecular mechanisms for idiopathic ventricular fi brillation. Nature. 1998;392:293–296. 6. Brugada J, Brugada P, Brugada R. The syndrome of right bundle branch block ST segment elevation in V1 to V3 and sudden death – the Brugada syndrome. Europace. 1999 Jul;1(3):156-66. 8. Ruben Casado-Arroyo, Moises Rodriguez-Manero, and Pedro Brugada. The choreography of the intermittent electrocardiographic Brugada pattern from beat to beat. doi:10.1093/eurheartj/ehs302. Online publish-ahead-of-print 10 September 2012. 9. Patricia Chavez, Daniel Bamira, Abel Casso Dominguez, Akshai Bhandary, and Eyal Herzog. 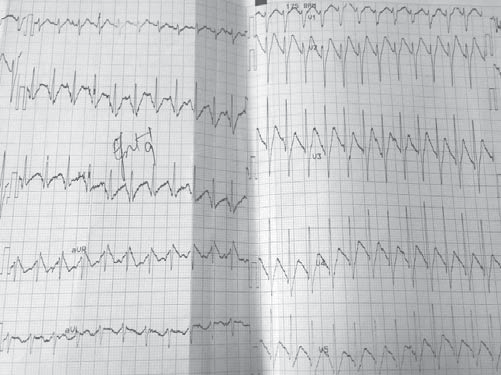 Intermittent Brugada Syndrome Presenting with Syncope in an Adult Female. Case Report. Hindawi Publishing Corporation. Case Reports in Emergency Medicine. Volume 2014, Article ID 742076, 3 pages. http://dx.doi.org/10.1155/2014/742076. 10. A. A. Wilde, C. Antzelevitch, M. Borggrefe et al., “Proposed diagnostic criteria for the Brugada syndrome: consensus report,” Circulation, vol. 106, no. 19, pp. 2514–2519, 2002. 11. C. Antzelevitch, P. Brugada, M. Borggrefe et al., “Brugada Syndrome: report of the second consensus conference,” Circulation, vol. 111, no. 5, pp. 659–670, 2005. 12. Priori SG, Napolitano C, Gasparini M et al. Clinical and genetic heterogenity of right bundle branch block and ST-segment elevation syndrome: A prospective evaluation of 52 families. Circulation. 2000 Nov 14;102(20):2509-15. 13. Y. Take, H. Morita, J. Wu et al. Spontaneous electrocardiogram alterations predict ventricular fi brillation in Brugada syndrome. Heart Rhythm, vol. 8, no. 7, pp. 1014–1021, 2011. Block and ST-Segment Elevation in Precordial Leads V1 to V3. Circulation, 105:73, 2002. 16. Priori SG, Napolitano C, Gasparini M et al. Natural history of Brugada syndrome: insights for risk stratifi cation and management. Circulation. 17. Gasparini M et al. Programmed electrical stimulation in Brugada syndrome: How reproductible are the results? J CardiovascElectrophysiol 13:880, 2002.
with up to three premature beats. EurHeart J 23: 1394, 2002. 19. Silvia G. Priori, Carina Blomström-Lundqvist, Andrea Mazzanti et al. 2015 ESC Guidelines for the management of patients with ventricular arrhythmias and the prevention of sudden cardiac death. The Task Force for the Management of Patients with Ventricular Arrhythmias and the Prevention of Sudden Cardiac Death of the European Society of Cardiology (ESC). Endorsed by: Association for European Paediatric and Congenital Cardiology (AEPC). European Heart Journal (2015) 36, 2793–2867.